David Isaacs is a South African actor and comedian best known for his roles in the television series SOS and Colour TV. He is also known for co-creating and starring in (with Oscar Petersen) the two-man comedy theatre show Joe Barber. Isaacs was born in Parkwood, Cape Town, into a family of musicians, and started playing piano at the age of four. His passion for music began at the age of seven when he sang for the St Georges' Cathedral choir. His stage debut a little later was in the operetta Old King Cole in which he appeared alongside his older brother, Roger Isaacs. Still shy of the stage and being more on the quiet side, David's two career choices were to be, either, a doctor or a classical pianist. The turning point, however, came after performing in High School production of The Caucasian Chalk Circle by Bertolt Brecht. David was bitten by the bug and encouraged by his drama teacher/mentor. He then enrolled at UCT Drama Department to take his discovered passion further. 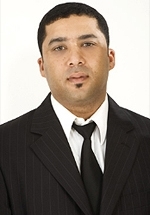 After leaving University, where he did numerous drama school productions including Shakespeare's Twelfth Night, Harold Pinter's The Caretaker, Luke Tagg's Insane and Reza de Wet's Diepe Grond, David was cast in his first professional production for the then CAPAB, Kinkels innie Kabel, a musical by Andre P Brink. Also for CAPAB, he played in Elizabeth by Dario Fo and Twelfth Night by Shakespeare. David's television career started with Skerpieon onder die Klip, a documentary by Idol Pictures about the history of the Afrikaans language in four parts, which he narrated. His first TV drama in 1996 was Hagenheim Streng Privaat for SABC. He was cast in Penguin Films' Fishy Feshuns, a sitcom in which he played the character Dino and was awarded Avanti nomination for best supporting actor in a comedy. In 2000 he teamed up with Oscar Petersen and Heinrich Reisenhofer to create Joe Barber and later that same year, David starred in another sitcom, SOS for e.tv, playing the character of Colin Abrahams. In 2001 he won the Avanti Award for Best Actor in a TV role and in 2002 he received an FNB Vita theatre nomination for Best Comedy Actor. His work also includes feature films of which Cape of Good Hope toured the world film festivals including the Cannes Film Festival, Toronto Film Festival and The Tribeca Film Festival. Further stage productions he performed in include Dario Fo's Stougatpassie, Skelm Streke, Mag Unplugged and South African premier of Athol Fugard's Coming Home.